For those of you that often check our blog in the winter months for news from the right whale calving grounds, we wanted to let you know why we have not been posting this year. For the first time in 26 years, the New England Aquarium will not be directly involved in Early Warning System (EWS) right whale aerial surveys on the southeast U.S. calving ground. The contract for the aerial surveys was awarded to colleagues at Florida's Fish and Wildlife Research Institute, who have previously run surveys in the southern portion of the EWS area. It is with much sadness that our field work in the area has come to a close. We would like to take this opportunity to look back at how it all began, how the calving grounds were discovered and how comprehensive survey efforts utilized data to identify and establish the many protective measures for right whales in that region. The calving ground for the North Atlantic right whale was discovered by scientists in the early 1980s, a period of many discoveries about this critically endangered population. By 1983, findings from marine mammal surveys along the eastern seaboard, combined with whaling records, led researchers to identify the use of four geographically distinct areas with annually consistent seasonal aggregations of right whales. The Bay of Fundy, Roseway Basin, Cape Cod Bay, and the Great South Channel were identified as important right whale habitats for feeding, socializing, and rearing of calves in the spring, summer and autumn months. However, scientists still did not know where these whales over-wintered, or where females went to give birth. Right whale records obtained from whaling logbooks, calf strandings, coastal sightings, and one tantalizing match of a right whale mother between Georgia waters and the Bay of Fundy sparked interest in looking for right whales off the southeastern U.S. In 1984, Scott Kraus from the Aquarium and Dave Mattingly, a pilot from Delta Airlines, organised an opportunistic survey effort along the coastline of Florida and Georgia. These early surveys were limited by the lack of funding and depended entirely on several Delta pilots (see image) who volunteered their time and their own private aircraft. Known as the Delta Surveys, the initial flights in February of 1984 discovered 13 right whales, including three mothers with newborn calves. This pioneering group of dedicated scientists and compassionate pilots made one of the most exciting discoveries for this endangered population, making national news. They had found where right whales go to give birth, enabling subsequent protection of this most vulnerable segment of the population. 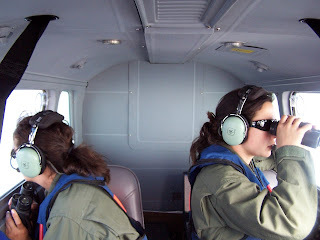 The Delta Surveys continued for several winters and eventually a field team from the Aquarium spent two months annually on location, relying on local volunteer pilots and planes as the efforts expanded. During the 1988 season, a close call between a dredge and a right whale near Amelia Island, FL prompted the Aquarium to request a shut-down of dredge operations at night. Because of the Navy's interest in dredging for the King's Bay Naval Submarine Base on the St. Mary's River in Georgia, they scheduled an emergency consultation with Amy Knowlton of the Aquarium, to discuss alternatives. Thus a strategy to conduct daily over flights during all winter dredging activities in the area continued to expand, and it became clear that more intensive survey efforts were needed to mitigate conflicts between human activities and right whales in the area. 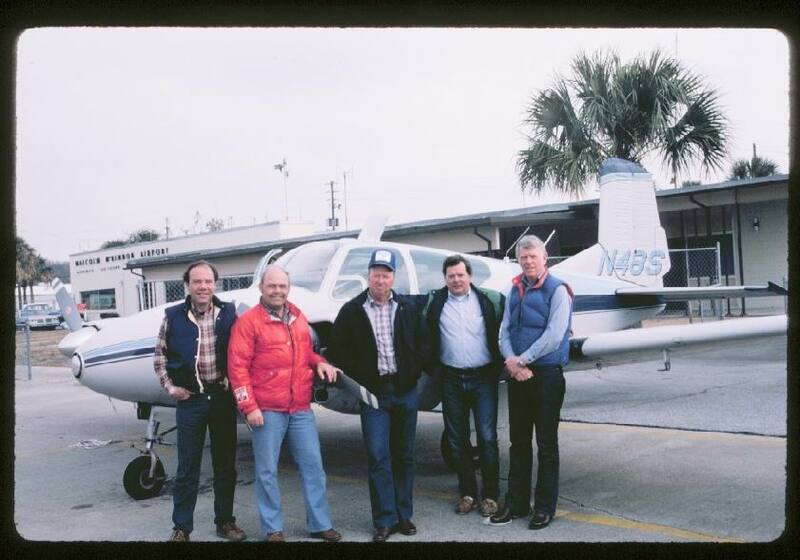 In the winter of 1994, with support from the Navy, the Army Corps of Engineers (ACOE), and the U.S. Coast Guard, the Aquarium began conducting daily EWS aerial surveys covering the three major shipping channels from Brunswick, GA to Jacksonville, FL. The field season extended to four months, from December through March. Over time, as more teams from the states of Georgia and Florida became involved, it was possible to expand the survey boundaries beyond the critical habitat to the north and south, and extend the tracklines from 15 nautical miles (nm) offshore to 35 nm. These modified surveys continue to this day. Over the years, the surveys have changed names, methods, observers and pilots, yet the primary goal - to warn ships about the presence of right whales - and the dedication of the participants has always remained constant. Most Aquarium right whale researchers have participated in at least one, and usually several EWS aerial survey seasons, in addition to our work in other critical habitats. This has given the Aquarium's team valuable, well-rounded survey skills and a deep understanding of the species through observation of their habitat-specific behaviors. It is a rare opportunity for the scientists who study marine mammals that cover such distances to work in more than one habitat within their vast migratory range, particularly when those migrations transcend international boundaries. One Aquarium researcher, Monica Zani (see image and this story about a survey that observed a right whale birth), has spent more time than any other following the right whale migration to the southeast. For ten years she has represented the Aquarium as a member of the aerial survey team, and as the survey coordinator. Her ever-adapting leadership of the Aquarium team has been invaluable to survey coordination and collaboration among the many different entities working for right whale conservation. As a result of these intensive surveys by the Aquarium and many colleagues, a variety of important measures have been implemented to protect right whales in the calving ground. These measure include the 1994 designation of the southeast U.S. Right Whale Critical Habitat under the Endangered Species Act; the 2006 implementation of recommended routes for vessels designed to reduce the area used by incoming and outgoing vessels for three ports in the calving ground; the 2007 rule banning the use of gillnets in the southeast U.S. to reduce fishery interactions with right whales; and the December 2008 implementation of the Ship Strike Reduction Rule which requires all vessels 65 feet or greater to travel at speeds of 10 knots or less in high-use seasonal right whale habitats. All of these measure were developed by government managers within the National Marine Fisheries Service using data and strategies provided by the Aquarium, other research organizations, state and federal scientists studying the species. The New England Aquarium is proud of having pioneered survey efforts in the southeast U.S. calving ground, and of the pivotal role we had in the development of the many protective measures now in place. Today, in the same waters where the last intentional U.S. killing of a right whale occurred in 1935, there is now an extensive set of protective measures in place and a collaborative network of scientists, government managers, and mariners working together to protect this species. Aquarium scientists are still involved in the calving ground field work through providing services for near real-time matching in order to help teams focus their shipboard research efforts on appropriate whales, and by providing health assessments of entangled whales to inform decisions on the urgency of intervention. So far this year, Aquarium researchers have confirmed 99 unique whales on the calving ground including 15 mothers and their calves. Labels: Aerial Survey, Calving Ground, southeast U.S.